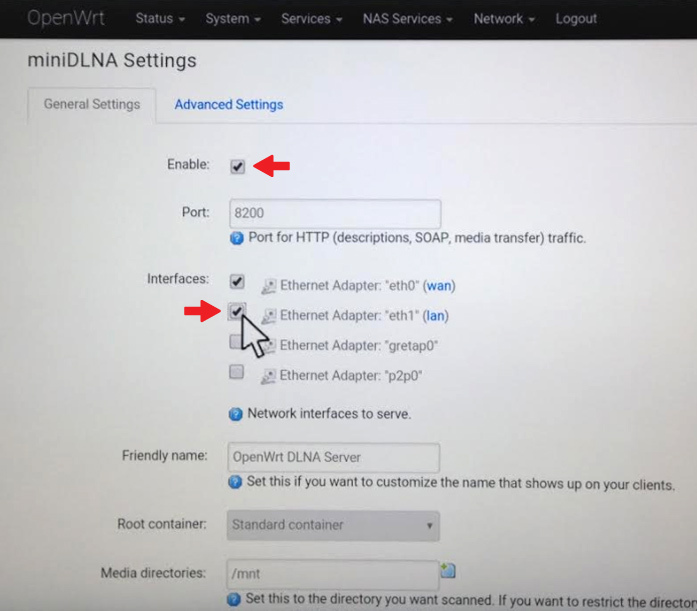 In addition to the Zappiti SMB Server function, you can access the content of a hard disk connected to your Zappiti 4K HDR from a TV, computer or game console connected to the local network via DLNA thanks to the MiniDLNA Server function located in the OpenWRT interface. 1. On the home page, click the "Settings" button (or press the GREEN button on the remote) to access the Zappiti player Settings. 2. 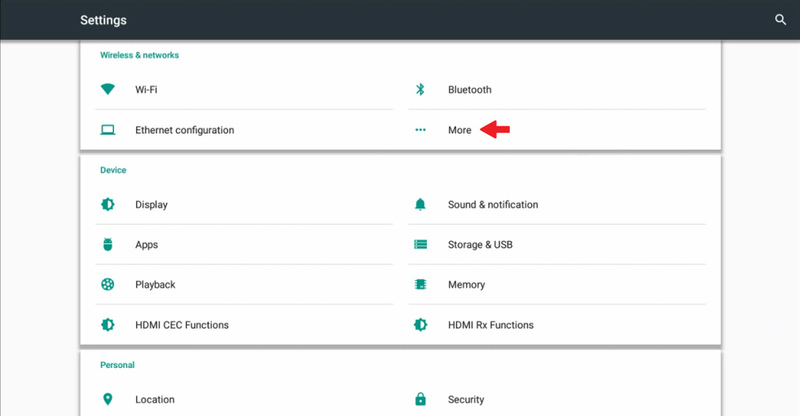 In the "Wireless & networks" section, click the "More" button located under the "Bluetooth" button. 3. In the "More" section, click the "Openwrt Settings" button to access the OpenWRT settings page. 4. On the "Openwrt Settings" page, click the last button at the bottom of the page titled "Advanced settings". Warning! The following section requires the use of a mouse. To activate the mouse mode, press the mouse button on the remote control, then use the directional buttons on the remote control to move the mouse cursor. 5. You will be redirected to a Web page with the title "Authorization Requiered". The "Username" field must have specified "root". The "Password" field is empty by default. Then, re-activate the mouse and click the "Login" button. Note: it is possible to customize the password but beware! If you lose the password, it will not be possible to retrieve it and all the SERVER functions of the player will be inaccessible. 6. 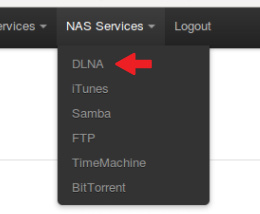 Using the mouse, click on the "NAS Services" section of the top bar. 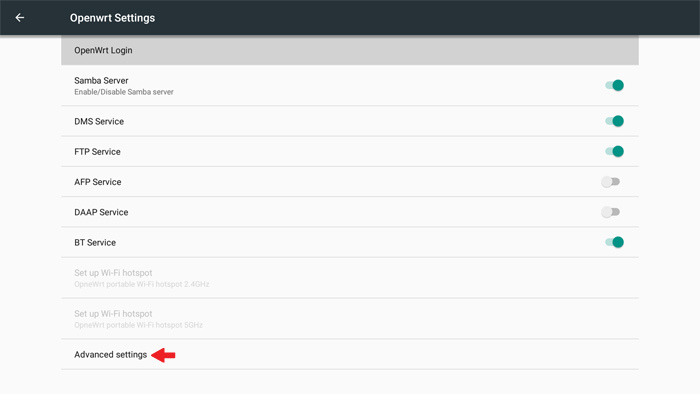 From the drop-down menu, click on the first line labeled "DLNA". 7. In the miniDLNA page, and in the miniDLNA Settings section, and the first tab (General Settings), please select the "Enable" check box. 8. Then turn off the mouse mode, and scroll the page using the DOWN ARROW on the remote control to go to the bottom of the page. Reactivate the mouse, and click the "Save & Apply" button. The DLNA server is now active! You can now access the contents of the hard drives connected to the Zappiti 4K HDR via DLNA on a network from a TV, computer or other device equipped with the DLNA Client service. If you are using Windows, launch the "Windows Media Player". 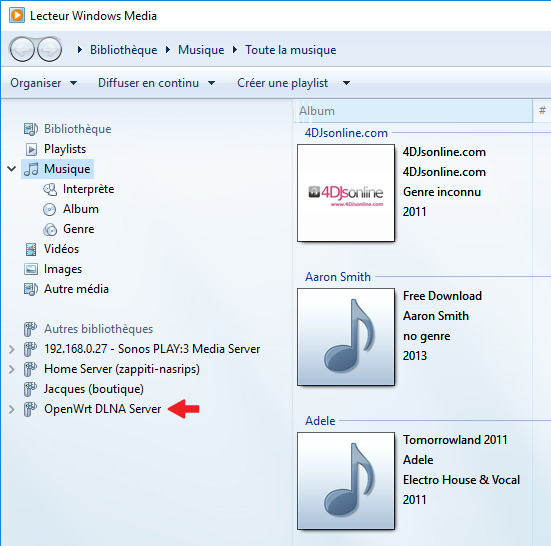 Then click "OpenWrt DLNA Server" and select the media type you want (music, videos, images, recordings).